[Snap] UFB Install happening... Finally!! Forums › 2degrees › [Snap] UFB Install happening... Finally!! After what has been months of talking and waiting it seems that finally my UFB install is happening. Came home yesterday to see a new bunch of cables poking out of the ground on what Chorus decided was a shared driveway. I say decided as we own half the driveway, but due to where they wanted to run the fibre, I was required to get consent from the neighbours before they would start. Everything started out fine with their contractor sending letters to all the houses, but as four of the six are rentals things came to a screaming holt. So I had to start the process myself. Thankfully all the tenants where forthcoming with the owners/rental agents details. After struggling to contact some of the owners I was then told by Chorus that consent from the rental agent was enough. Umm thanks for that, but why wasn't I told that at the beginning of the process. Would have made things much easier! Anyway I am now into month four and finally some action is happening. While Snap haven't ever actually contacted me in regards to what is happening they have responded to my many emails and phone calls quickly. I know that this isn't any of their doing but would feel some followup on their side would have been nice. So hopefully (Fingers crossed) in the next week or so I should finally be able to sit down and not have the kids and other half bitching about the interweb running slow, while they are all watching Netflix/Youtube/Facebooking!!! Yes that was my bubble getting burst. Just had an email from Snap saying that my installation is delayed for a second time. Sigh. And no date set for when it will be installed. Starting to understand why the uptake of UFB is so low. So close Tockly! Sorry to hear about your delays. Can agree with sentiments about Snap!, when we had fibre installed we heard nothing from them - updates were gained via phone calls to them only. Enable were great however and called us several times with status updates. Hope your wait isn't too long, its worth it! Tockly: I was then told by Chorus that consent from the rental agent was enough. Really ? That dosent sound right... I know the agent is acting on behalf of the owner but isnt the one paying the bills at the end of the day. Yes many rental agents and property managers can and do sign consent forms on behalf of owners. It is especially common for commercial buildings as commercial property managers often have complete control over almost all aspects of the building. Tockly: After what has been months of talking and waiting it seems that finally my UFB install is happening. Came home yesterday to see a new bunch of cables poking out of the ground on what Chorus decided was a shared driveway. Have had a bunch of people in my driveway, but they seem to have disappeared and nothing has happened since. Wonder if it has anything to do with the couple of wet days recently? And here we are 12 days on and still nothing happening. Is it just me are Chorus the most difficult company ever to deal with?? I have just been informed that I live in a MDU. Will actually no I don't I live in a stand alone house!! Admittedly I am surrounded by flats, but if you take a look even on Google Maps it very clearly shows that I am a stand alone house. They have delayed the install yet again due to being a MDU. Why should my order as a stand alone house be delayed just cause I have flats around. They are nothing to do with me!! They have run the duct up the driveway and there is a box outside my gate. Just blow the fibre up and we are done. Sorry that I am ranting, but this is so frustrating. On a positive Snap have been much better at communicating things back to me, even if the news is completely pants!! Tockly: Is it just me are Chorus the most difficult company ever to deal with?? If your dwelling is located on the same property parcel as the neighbouring flats, or you share your driveway with one or more of those flats, then consent from the property owner(s) is required - even if your house is standalone. All the consents have already been given and the duct is in the ground and has been for just on a month. I got the long awaited email from Snap with the scoping and installation dates. Still almost a month away but at least this is finally some progress. Should I get in touch with 2Degrees (Snap) to get them to check things? 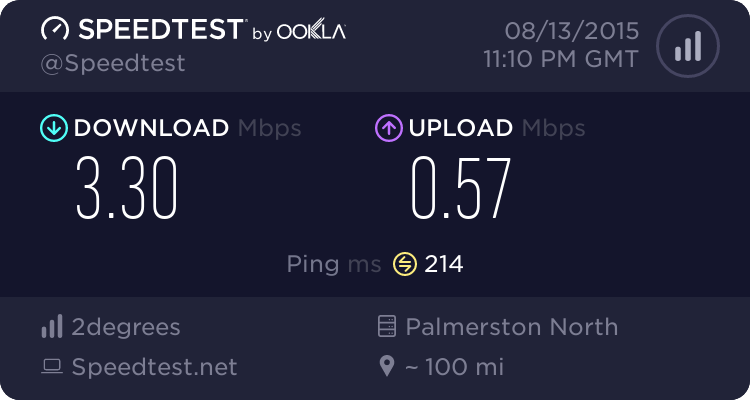 Performance seems to be fine, youtube flies, but the speedtest seems strange. 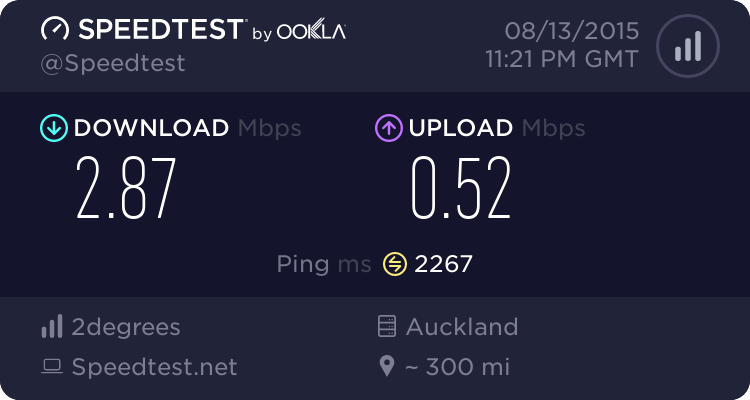 Do a test to the 2degrees speedtest site in Auckland and see what you get. I am guessing it will be fine. Are New Zealand sites loading ok?